By definition the normal stress is that which acts normal to the plane, i.e. the line of action of the normal stress has the same direction cosines as the normal to plane viz: I, m and n.
Whilst eqn. 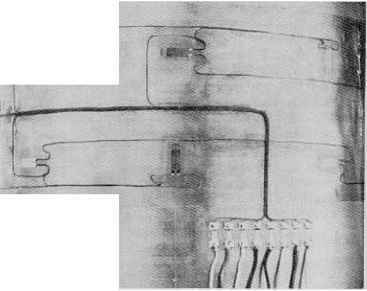 (8.28) has been derived for the shear stress r^ it will, in fact, apply equally for any type of stress (i.e. shear or normal) which acts on the plane ABC in the <p direction. since the stress and the normal to the plane are in the same direction. Eqn. (8.29) then reduces to that found previously, viz. eqn. (8.18). The procedure used for constructing Mohr's circle representation for a three-dimensional principal stress system has previously been introduced in §13.7+. For convenience of reference the resulting diagram is repeated here as Fig. 8.8. A similar representation for a three-dimensional principal strain system is shown in Fig. 8.9. Fig. 8.8. 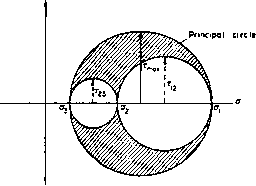 Mohr circle representation of three-dimensional stress state showing the principal circle, the radius of which is equal to the greatest shear stress present in the system. Fig. 8.9. Mohr representation for a three-dimensional principal strain system. ' E.J. Hearn, Mechanics of Materials I, Butterworth-Heinemann, 1977. 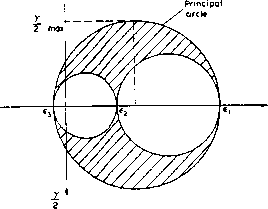 In both cases the principal circle is indicated, the radius of which gives the maximum shear stress and half the maximum shear strain, respectively, in the three-dimensional system. This form of representation utilises different diagrams for the stress and strain systems. An alternative procedure uses a single combined diagram for both cases and this is described in detail §§8.6 and 8.7. 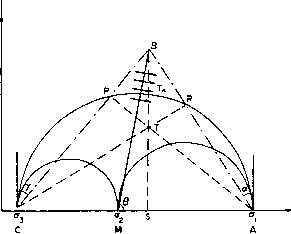 As before, let the inclined plane have direction cosines /, m and n. A true representation of this plane is given by constructing a so-called "true shape triangle" the ratio of the lengths of its sides being the ratio of the direction cosines-Fig. 8.10. Fig. 8.10. Graphical determination of direction of shear stress on an inclined plane. If lines are drawn perpendicular to each side from the opposite vertex, meeting the sides at points P, R and S, they will intersect at point T the "orthocentre". This is also the point through which the normal to the plane from O passes. The required direction of the shear stress is then perpendicular to the line BD. The equivalent procedure on the Mohr circle construction is as follows (see Fig. 8.11). Construct the three stress circles corresponding to the three principal stresses a 1, ct2 and <73. Set off line AB at an angle or = cos-11 to the left of the vertical through A. Set off line CB at an angle y = cos-1 n to the right of the vertical through C to meet AB at B. Mark the points where these lines cut the principal circle R and P respectively. Join AP and CR to cut at point T.
Join BT and extend to cut horizontal axis AC at S.
With point M the <72 position, join BM. 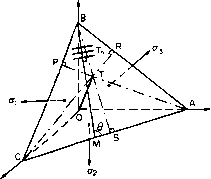 The required shear stress direction is then perpendicular to the line BM. Fig. 8.11. Mohr circle equivalent procedure to that of Fig. 8.10.